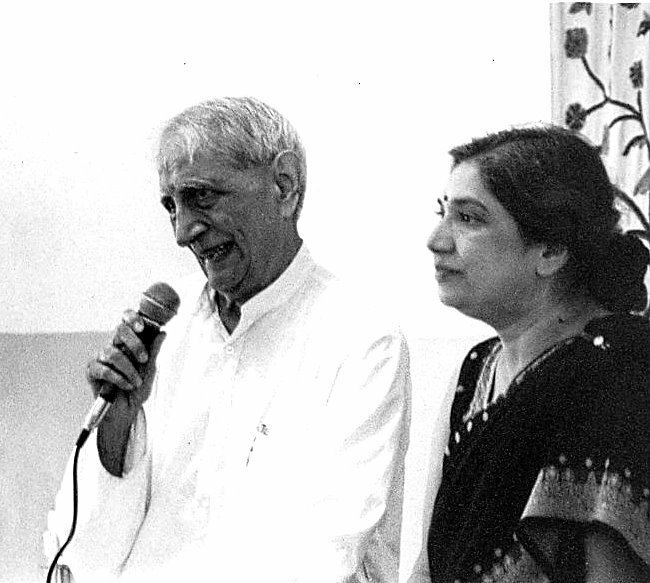 Following is a translation of Dr. Jayadeva and Smt. Hansaji’s speeches as reported by the students of the Teacher Training Course. "We are dragged by various situations and circumstances and we carry on all our life. We blame others and say that we are not brought up properly or do not have good company. In order to change, one has to have the strong urge and feeling inside. When something big happens, that is when we say we want to change and forget. We need to cultivate the quality of awareness, decision making and action. We come to The Yoga Institute, but there needs to be a deep burning desire to make change possible. This might take months or years. Occasionally we read scriptures and hear about them but it doesn't remain with us. " "Yoga is a science of awareness. It is a culture of consciousness, and the character of consciousness is to always be in a blissful state. An individual’s true self is ‘Sat-Chit-Anand’ which has to be maintained under all circumstances. People take birth and perish. People experience feelings as per the external circumstances - being happy in joyful situations and being sad in sorrowful situations. But through yoga we develop wisdom to maintain our balanced state of mind and not get affected with the external stimulus. We have got to believe in a higher reality and we will automatically get the strength to withstand under all circumstances. We must accept all the situations in our life. We must accept the occurrence of birth and death. When we get unhappy or negative in life, this indicates that we lack faith in God. We should always have awareness of God, or else the pain will overpower us. We don’t know what is going to happen in the next moment, but we should be prepared for change, because change is the nature of existence. We must keep our efforts ongoing and not get stuck in the material world."